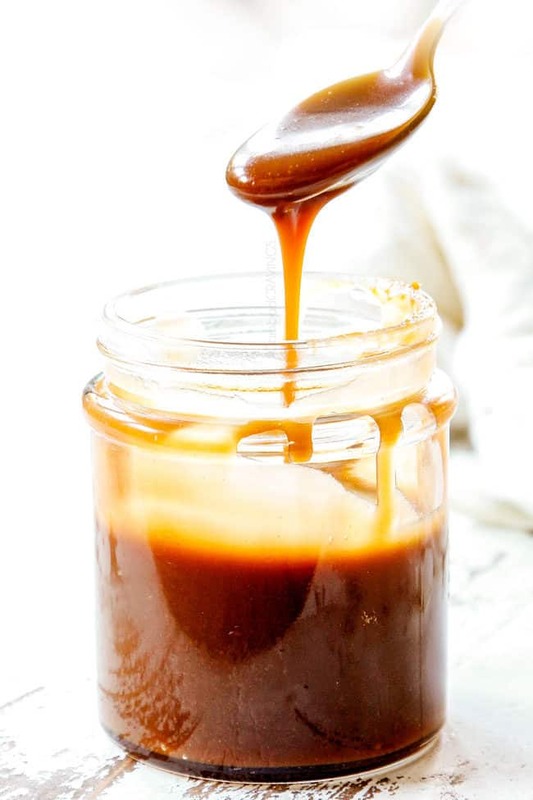 This Caramel Sauce Recipe is rich, creamy, buttery, sweet and 1,000X better than any store bought caramel sauce! In anticipation of the Toffee Pecan Caramel Pound Cake I am sharing with you this weekend (in time for Easter!) 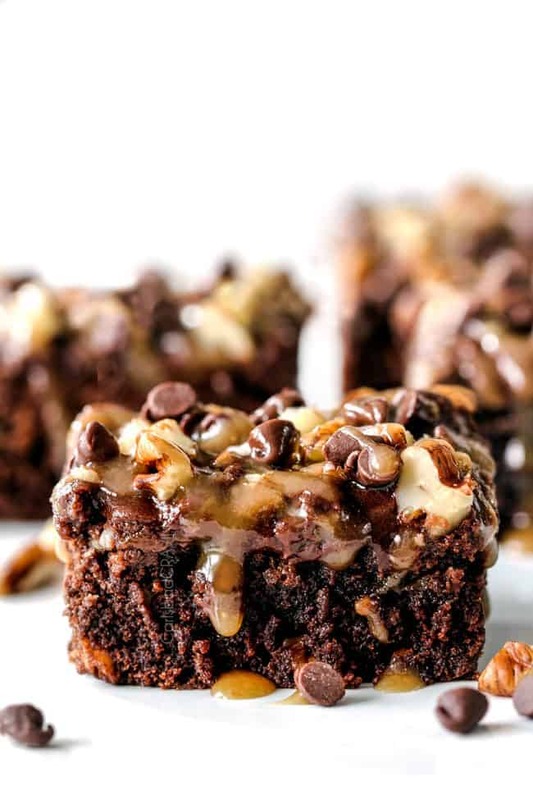 and my Poke Turtle Brownies, I thought I would start with the wonderfully decadent, creamy homemade Caramel Sauce Recipe because this caramel sauce deserves it’s very own post. Just like this easy Caramel Sauce makes the pound cake better, this Caramel Sauce makes everything better. This homemade Caramel Sauce recipe makes apples, bananas, pretzels and popcorn better. It makes waffles, French toast, crepes and pancakes better. It makes cookies (especially in a skillet! ), brownies, cheesecake, and ice cream better. You get the idea. 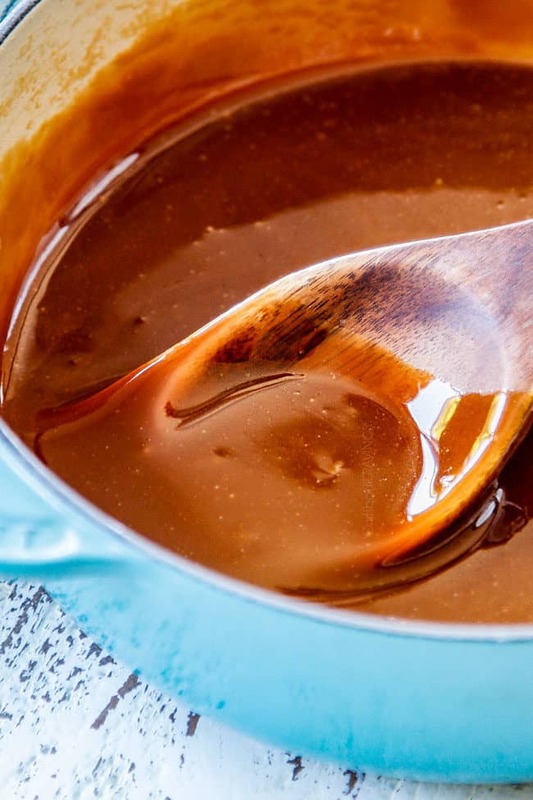 This easy Caramel Sauce recipe pretty much makes everything better. At some point though, it becomes not about making a food taste better but rather just finding new vehicles to douse with caramel so there are more “legitimate” reasons to put caramel in my mouth. Be cautious though, its a creamy, lip smacking, finger licking slippery slope. First its drizzled on ice cream, next its bathing carrots. I am asked for the recipe every time I bring it anywhere! Its rich, creamy, buttery and sweet and 1,000 times better than any store bought Caramel Sauce Recipe. What is caramel sauce made of? Caramel Sauce is traditionally made of granulated sugar that cooks at a certain temperature until it caramelizes. It is combined with heavy cream, butter and vanilla extract. Caramel sauces made with granulated sugar are not fool proof as the sugar can burn easily AND they take longer to make. 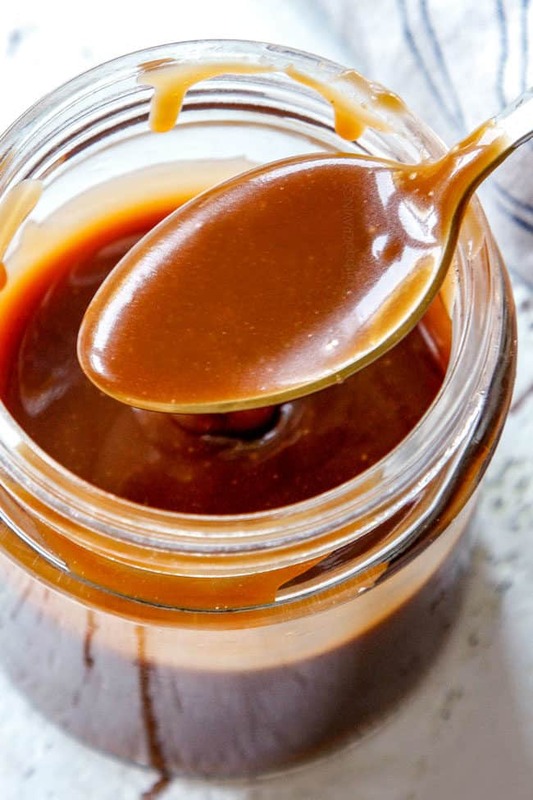 This Caramel Sauce recipe is unique in that it starts with brown sugar instead of granulated sugar which not only cuts down on cooking time but boasts a richer flavor in way less time! BUTTER: Use unsalted butter so you can control the amount of salt in your caramel sauce. Do NOT use any substitutes! BROWN SUGAR: When a recipe doesn’t specify a type of brown sugar to use, it means to use light brown sugar. For this Caramel Sauce recipe, I use light brown sugar, but it comes down to personal preference. 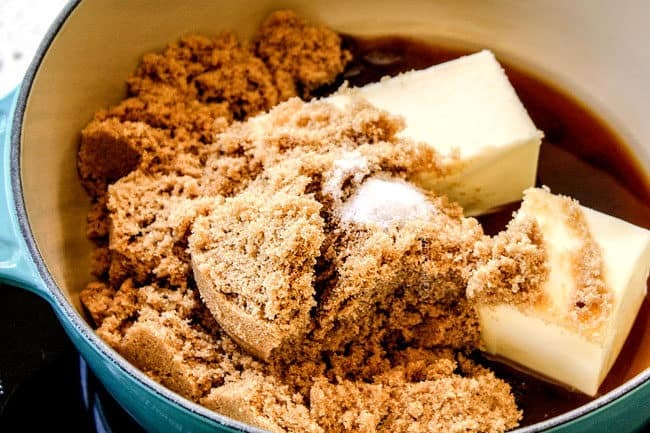 Make sure it is packed for the correct ratio of brown sugar to butter. 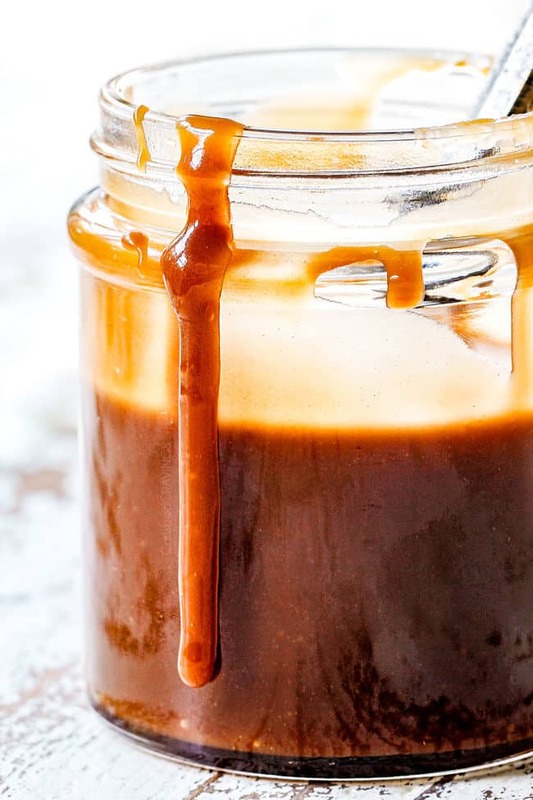 EVAPORATED MILK: I love using evaporated milk in this Caramel Sauce Recipe because I always have it on hand which means I can make caramel at a seconds notice. 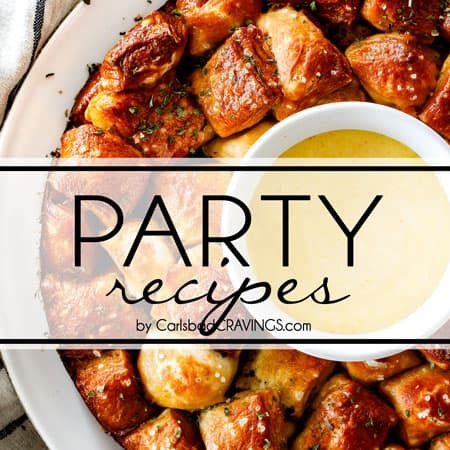 It also delivers fool-proof results because it incorporates into the caramel easier. VANILLA EXTRACT: Use pure vanilla extract, the better quality, the better the taste. SALT: You can use more or less salt to taste but I find salt essential otherwise the Caramel Sauce is too sweet. I use evaporated milk because it incorporates more easily into the caramel so you are left with creamy caramel sauce every time. That being said, if you only have heavy cream on hand, then yes, you can definitely use it instead of evaporated milk. Now to making this easy Caramel Sauce recipe. I am not going to lie. I have burnt caramel before. But not this caramel. This caramel is FOOL PROOF! If you can boil butter, brown sugar and a smidgen of water then stir in evaporated milk and vanilla, than you can make this caramel in 5 minutes! SO EASY! Step 1: Add butter, brown sugar, water, and salt to medium saucepan and heat over medium-low heat, stirring until butter melts. Step 2: Bring to a boil then reduce to a simmer, whisking constantly until thickened, approximately 5-8 minutes. Keep in mind, the caramel sauce will thickens more as it cools. Step 3: Remove from heat and stir in 1/2 cup evaporated milk (it will bubble a lot) and vanilla. Add additional evaporated milk to reach desired consistency. 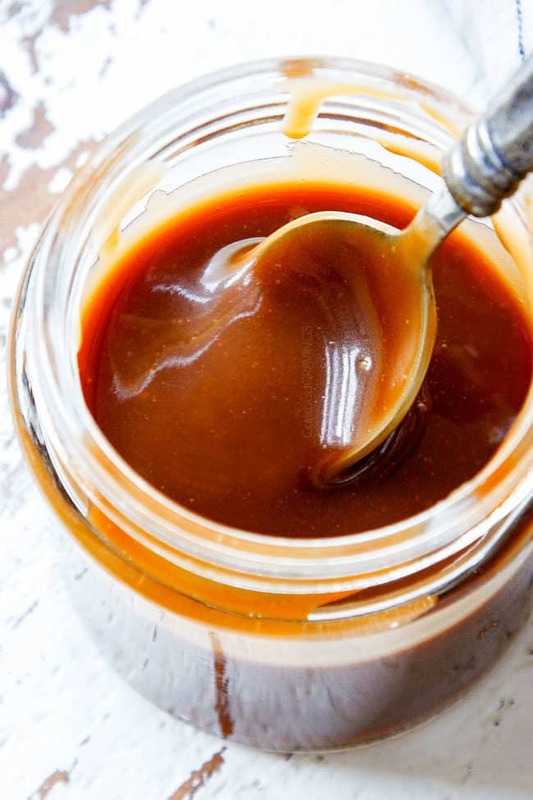 You can transform this Caramel into Salted Caramel Sauce by simply adding more salt! Follow the recipe as directed then stir in additional salt to taste – I would start with 1/8 teaspoon then add more if desired. For even more gourmet Salted Caramel Sauce, omit the salt in the recipe and stir in 1/2 teaspoon sea salt (or more to taste). 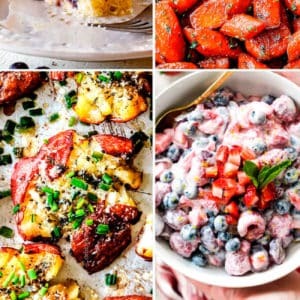 Use a thick-bottomed, sturdy pan: the sugar needs to cook evenly which is much easier to do in a thick-bottomed, sturdy pan that is made to evenly distribute the heat. A thick bottomed pan will also help your sugar from burning. Size of pan: Use a medium saucepan with high sides. If the pan is too wide, the caramel is more likely to burn; to small, and the evaporated milk will overflow when it is added and bubbles up. Prep ingredients: have your evaporated milk and vanilla ready so you can add them as soon as you remove the caramel from the heat; this will prevent it from burning. Brown sugar: don’t replace the brown sugar with granulated sugar otherwise this will require a different method/recipe. Heat: Don’t simmer over too high of heat otherwise your caramel can burn. It is better for your caramel to take longer to thicken over lower heat than for it to thicken quicker and risk burning. Oven mitts: I suggest wearing oven mitts to protect yourself against any spatters, especially when you add the evaporated milk. 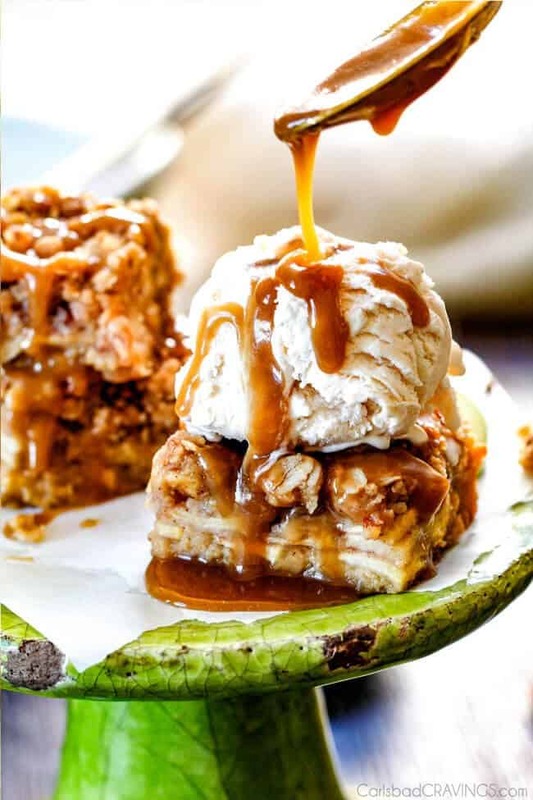 Consistency: The caramel sauce will look thick and then it will thin again once you take it off the heat – don’t worry, it will thicken again as it cools to room temperature and even more once refrigerated. For thicker caramel sauce, cook for longer and add less evaporated milk. For a thinner caramel sauce, cook for less time and add more evaporated milk. Don’t double/triple: I don’t recommend doubling or tripling the caramel sauce recipe as it could prevent the sugar from melting evenly. Can you thicken caramel sauce? 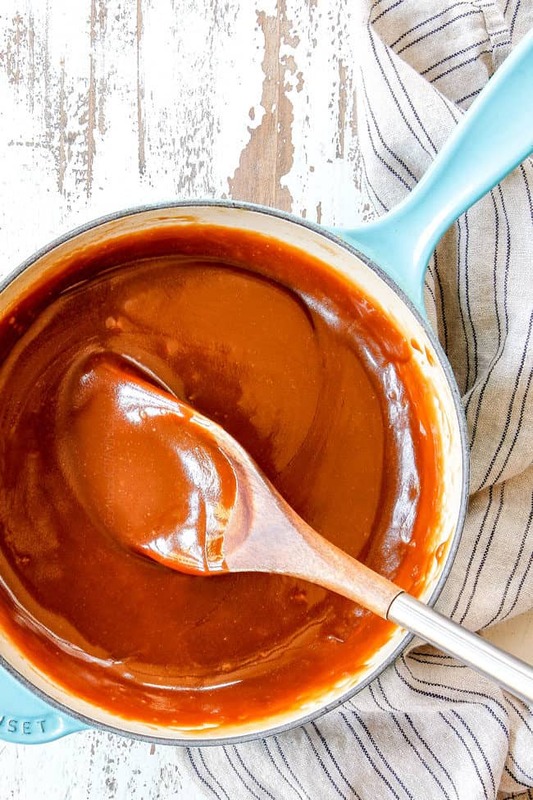 You can completely control the consistency of this caramel sauce. For thicker caramel sauce, boil for longer and add less evaporated milk at the end. Why is my caramel sauce grainy? 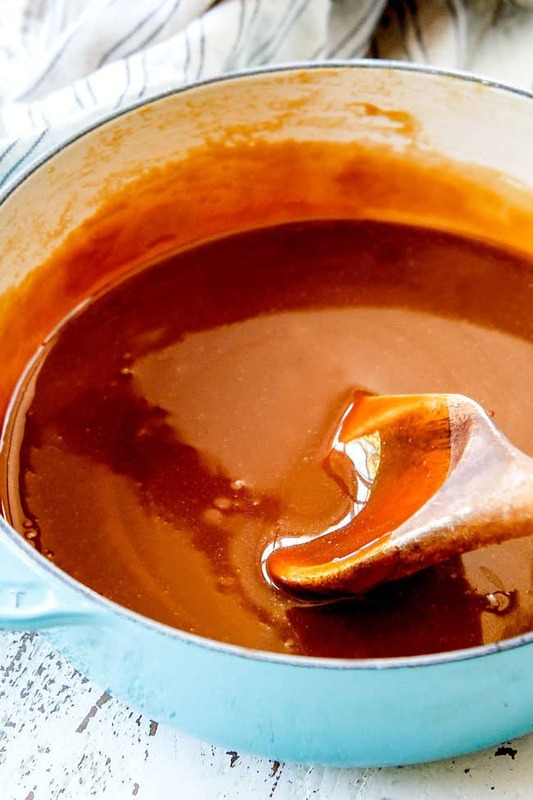 I have never had a problem with grainy caramel using this Caramel Sauce recipe. I believe using brown sugar is the key. Grainy Caramel Sauce is caused by undissolved sugar crystals. 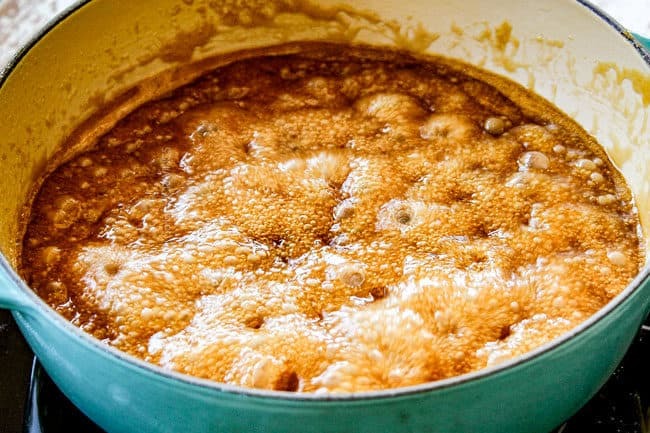 This can happen when either 1) the sugar in the caramel sauce has not fully dissolved or 2) some of the crystallized sugar that forms on the sides of the saucepan as the caramel boils have been incorporated into the caramel. How Do I fix Grainy Caramel Sauce? 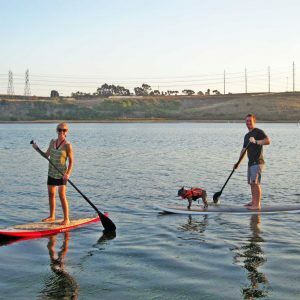 Stir: This is the method I use. 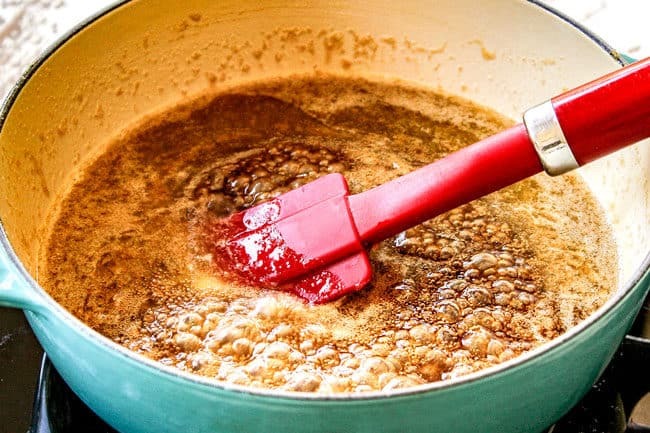 You can prevent the formation of sugar crystals by stirring your caramel sauce often with a rubber spatula, including the sides of the saucepan where the crystals like to form. Oil (EASIEST): Before you add your ingredients, grease the sides of your pan with vegetable oil. This will prevent the sugar from ever sticking and crystallizing. Dissolve sugar: Your Caramel Sauce might be grainy just because the sugar isn’t fully dissolved. Try cooking on low so all the granules break down completely. Corn syrup: To prevent sugar crystals from forming you can add 1-2 tablespoons corn syrup to the pot with the butter and brown sugar. Corn syrup keeps the sugar together and minimizes the possibility of stray crystals forming. Corn syrup is used in candy making for this very purpose. It is also often added to ganache recipes to keep them silky. You can also try adding corn syrup after your caramel has become grainy and cooking on low until smooth. Acid: You can add a 1/8 teaspoon of lemon juice, vinegar, or cream of tartar before cooking. The acid breaks up some of sucrose which makes the sugar more cohesive. Water: After the butter is melted, brush the inside of your pan with a damp pastry brush or paper towel. This will dissolve any sugar crystals and keep them from becoming part of the caramel sauce. How Do I reheat Caramel Sauce? Microwave Caramel Sauce for 30-60 seconds, stirring at 30 second intervals, repeat as needed. You may need to stir in additional evaporated milk as the caramel will thicken up on refrigeration. You can also reheat caramel sauce on the stovetop but I find this is more of a hassle to transfer the caramel to the saucepan than it is worth. Does Homemade Caramel Sauce Go Bad? Homemade Caramel Sauce can be kept at room temperature for 3 days or for a longer shelf life, in the refrigerator for up to three weeks or frozen for up to three months (see below). Does Caramel Sauce need to be refrigerated? This Caramel Sauce utilizes evaporated milk which is further stabilized by the sugar and therefore does not have to be refrigerated immediately – just think about caramel apples! That being said, I do suggest refrigerating leftover caramel sauce because it will keep for longer but it is perfectly fine to be left at room temperature on cakes, brownies, etc. or as caramel sauce gift jars. How Do I store homemade caramel sauce? Let Caramel cool completely then transfer it to a jar or airtight container. 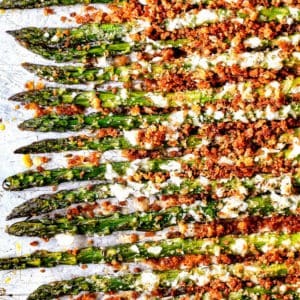 Refrigerate for up to three weeks. Can I freeze Caramel Sauce? 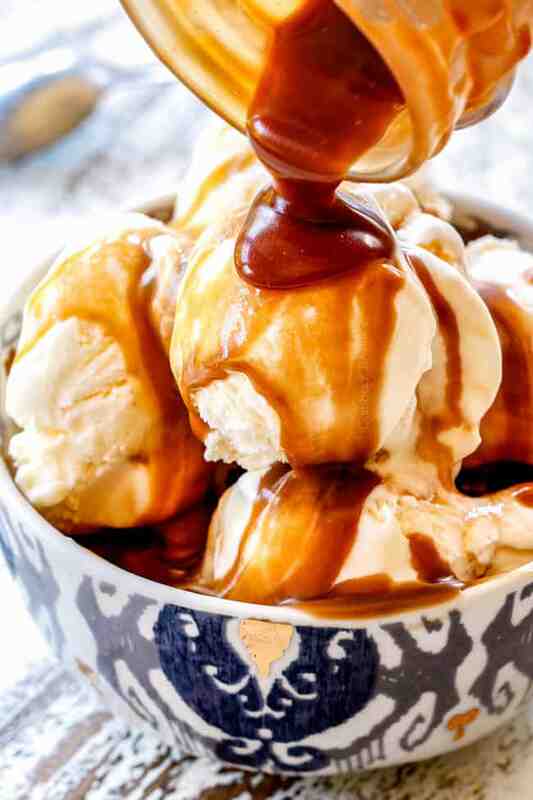 Yes, you can absolutely freeze Caramel Sauce! Freezing Caramel Sauce is fabulous when you make a double/triple batch and store the leftovers for a later use. It also works great when you don’t use all the Caramel Sauce at once or only need part of it for a recipe. Let Caramel Sauce cool completely. Transfer caramel to an airtight container that is NOT glass because the milk expands when frozen and can rupture the glass. When ready to use, let caramel defrost completely in the refrigerator overnight. What Can I Use Caramel Sauce for? 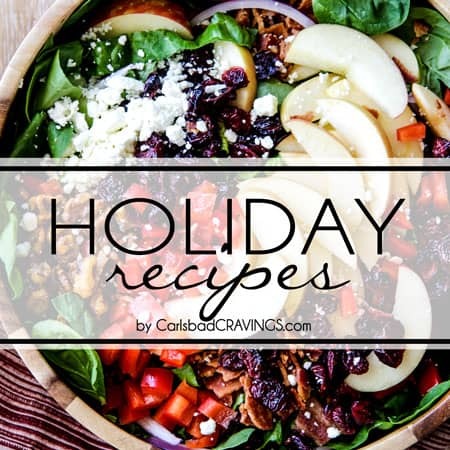 Apple Pie, Mud Pie, Cookie Pie, Pecan Pie, Banana Pie, almost any pie! GIFTS! Jar Caramel Sauce with a nice ribbon/tie and deliver as Christmas gifts, birthday gifts, teacher gifts, etc. How do you make caramel syrup? This Caramel Sauce recipe can be made into any consistency by adding more or less evaporated milk. To make caramel syrup or runny caramel, follow the recipe then add additional evaporated milk until it reaches desired consistency. 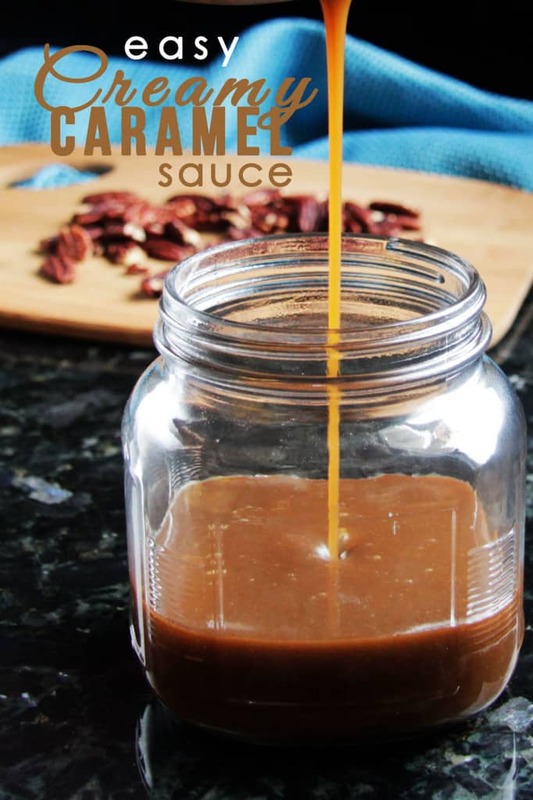 Want to Try this Caramel Sauce Recipe? 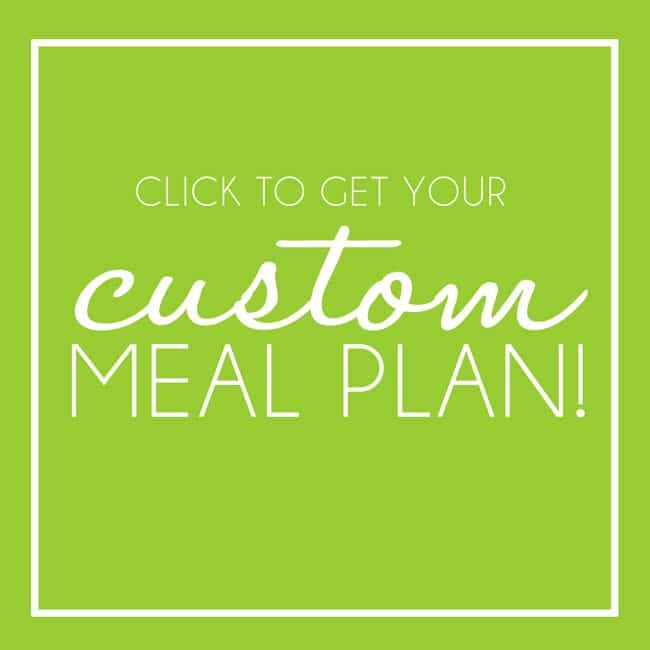 Pin it to your Homemade, Easy or Dessert Board to SAVE for later! 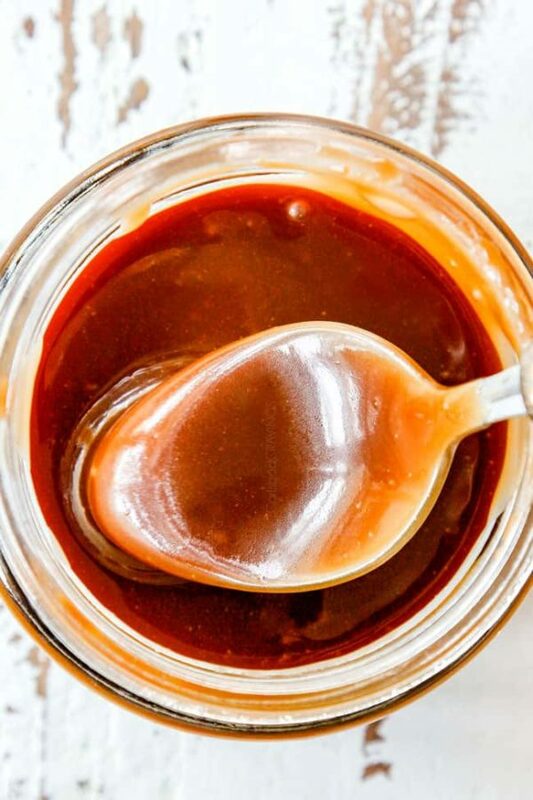 This Caramel Sauce Recipe is rich, creamy, buttery, sweet and 1,000X better than any store bought caramel sauce! 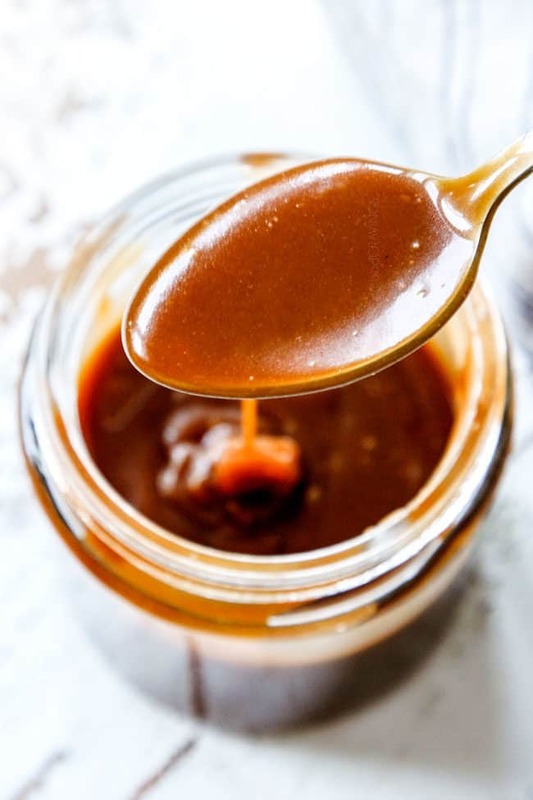 This easy Caramel Sauce recipe is FOOL PROOF, ready in 5 MINUTES and lick-the-spoon delicious! Add butter, brown sugar, water, and salt to medium saucepan and heat over medium-low heat, stirring until butter melts. Remove from heat and stir in 1/2 cup evaporated milk (it will bubble a lot) and vanilla. Add additional evaporated milk to reach desired consistency. Consistency: the type of pan, size of pan, and level of simmer all affect the caramel consistency, consequently, the end result will not be the same for everyone. To that end, I suggest starting with 1/2 cup evaporated milk and if you would still like thinner caramel, then you can stir in additional evaporated milk. 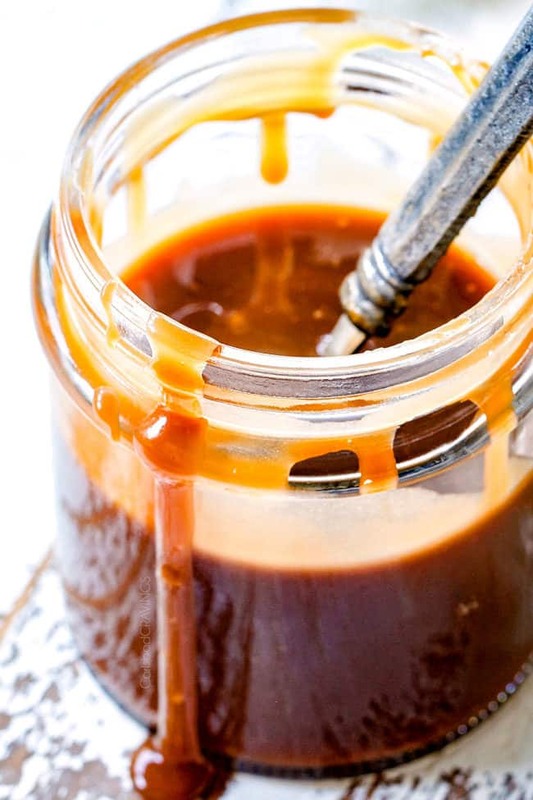 Storage: Store Caramel Sauce in the refrigerator in an airtight container for up to three weeks. 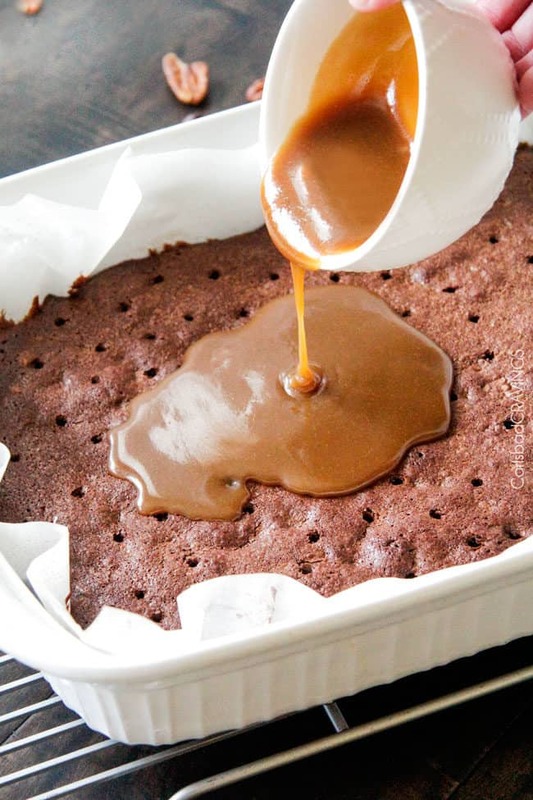 Caramel is safe at room temperature on cakes, brownies or gifts for up to three days. 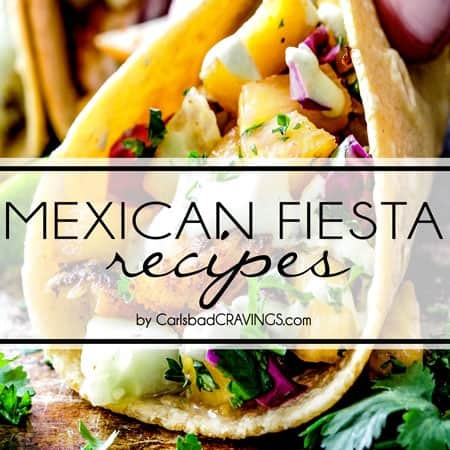 Freeze: You can also freeze the sauce for up to 3 months. Just make sure to use an airtight container that's NOT glass because the milk expands when frozen and can rupture the glass. Defrost the sauce overnight in the fridge and warm gently before using. Reheat: This caramel reheats beautifully in the microwave or stovetop. I dont have any vanilla can it be made without the vanilla? I am considering making some chocolates for Christmas gifts, do you think this caramel would work as a filling for chocolates? Hi Jonathan, no, I would look for a recipe with corn syrup in it for that purpose. Sorry! Hi! I’m not clear as to how much evaporated milk. It doesn’t seem to be an exact amount. Please if you could clarify I would appreciate it! Thanks! Hi Carol, in step 3 it says to “stir in 1/2 cup evaporated milk.” You can add additional evaporated milk for a thinner sauce if you would like. Enjoy! As written, could this be used in a carmel stuffed brownie recipe? Or would I need a thicker carmel sauce? 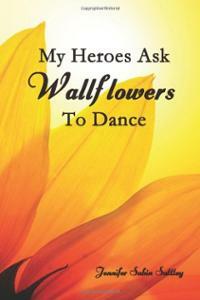 What is your suggestion? Hi Taylor, you could use less evaporated milk to create a thicker caramel sauce and then it should be great! 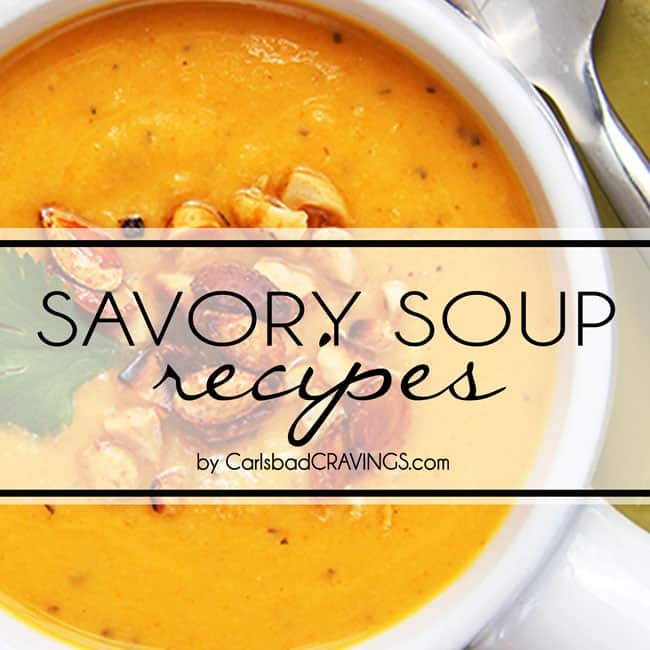 You can substitute heavy cream. Enjoy! 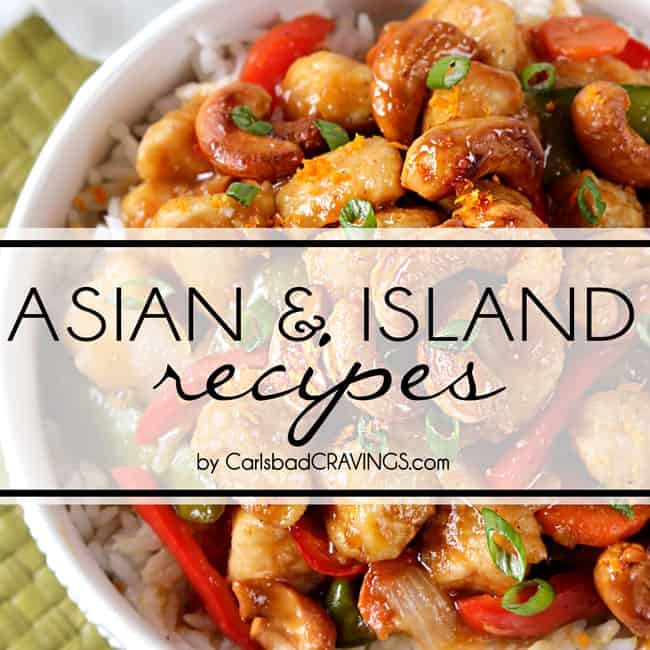 This recipe sounds easy to make and I have done so many and still have no caramel sauce so I am somewhat antsy to say the least. I have one question about ingredient. 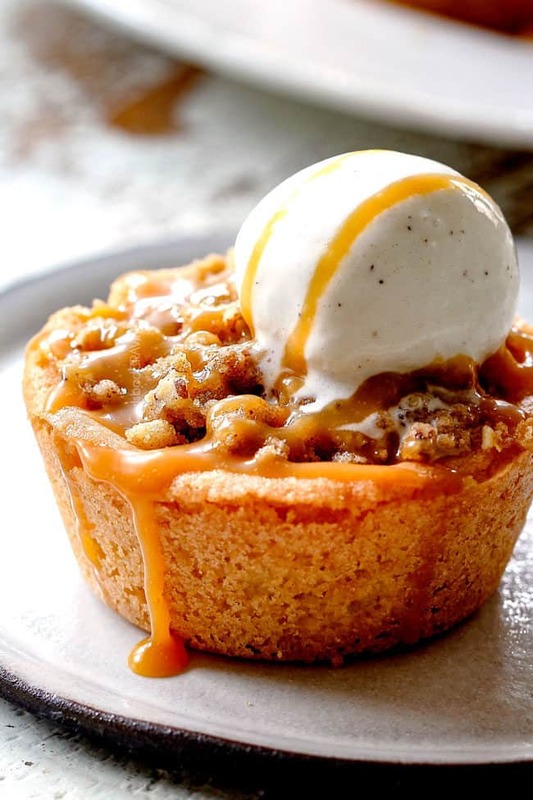 Hi Ralph, I hope you finally have success with caramel with this Caramel Sauce recipe! 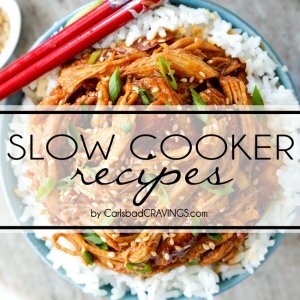 There are many factors that affect the end consistency of caramel – the type of pan, size of pan, level of simmer, consequently, the end result will not be the same for everyone, that is why I advise starting with 1/2 cup evaporated milk and if you would still like thinner caramel, then you can stir in more. I hope that helps! Just made this caramel sauce. It is delicious and fool proof. Thanks. You’re so welcome! I’m so happy you loved it! Jen, I have never made caramel sauce before. But I love caramel. 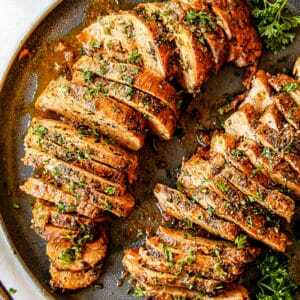 This was fhe easiest recipe and the best. caramel sauce I have ever had. I put it in the freezer and used it on many desserts, ice cream and coffee. I couldn’t keep my spoon out of it. Super creamy delicious and not sickening sweet. YAY! I’m thrilled this caramel sauce was a huge success! I love the idea of keeping it in the freezer. Thanks Susan! I made my caramel sauce in tin in water for 6hrs.. it seemed to be set perfectly.. i stored my tins in the fridge for a few days.. i made my individual banoffe pies and put the banana and cream on.. the first day they were great but second and third days the caramel started to weep… any ideas to prevent this from happening.i stored them in fridge from the beginning.. just the weeping ruins the dessert..
Hi leanne, there are some great articles if you search “how to prevent my pie from weeping. 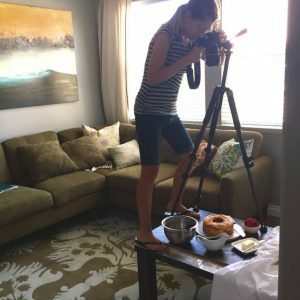 Here is one: https://www.bhg.com/recipes/how-to/bake/how-to-prevent-meringue-pie-topping-from-weeping/ Good luck!